What an EPIC Day!! Our This and That Smash Book (#131268) has these STUNNING... AMAZING printed pages of Designer Series Paper on EACH Page (!!)... so it's a decorated-blank surface to have fun with Journal, Scrap Booking, Memory Keeping and MORE!! 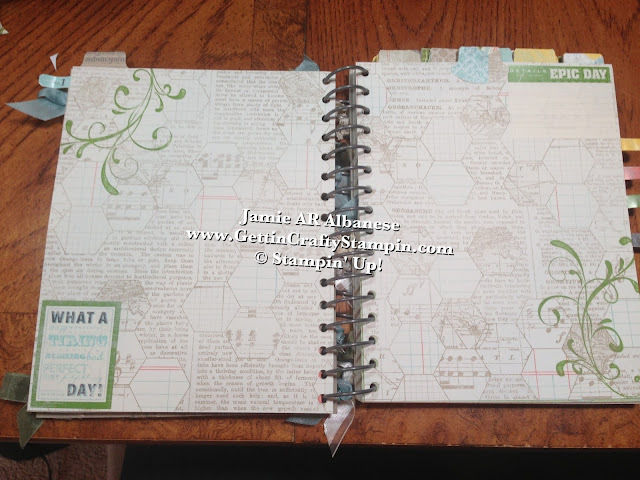 Join Me as we Peruse these two fun page spreads... and leave me a comment letting me know what you think, please (and Thank You)! The This and That Book (#131268) has available these adorable Stickers.. the Epic Day This and That Designer Stickers (#131271) that are color coordinated to the pages inside - making it fun and easy to look amazing when designing your pages (the pockets in this book are a great place to hold them and use them as you work on your book). HERE the Honeycomb patterned globe/dictionary pages are embellished with our Epic Day This and That Designer Stickers and the color coordinated inks... here with Gumball Green ink (#126861) this Everything Eleanor (#131897) stamp set has this beautiful natural flourish... since this book is designed for a student at our EARTHS School... natural is a MUST - lol. This VINTAGE Green Map is just stunning... incorporating our Epic Day This and That Designer Series Paper (#130814) with this Blue sheet - the water mark circles are funky and incorporating her favorite colors!! Our Labels Collection Framelits (#125598) and Big Shot (#131439) allow me to determine the size of the shape I want... here I had it go "off" the edge - lol... it's a fun way to add to a book or page! 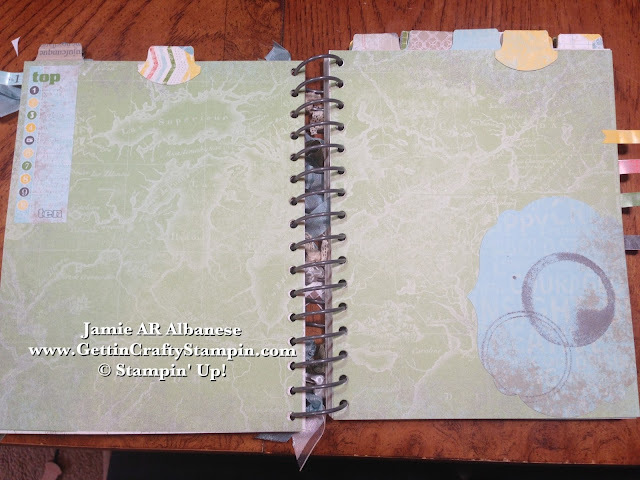 What a FUN way to Change Up journal, scrap booking, gifting... at a great price with TONS of coordinated options... the top 'tabs' are all coordinated from the Epic Day This and That Designer Series Paper... it's just another fun way to add to a page and easily! CLICK HERE and See Our New Catalog.. Go to Page #155 and See this amazing collection!! Remember that you can shop 24/7 from the comfort of your own home and EARN Rewards and possibly Hostess Dollars for FREE Merchandise! !